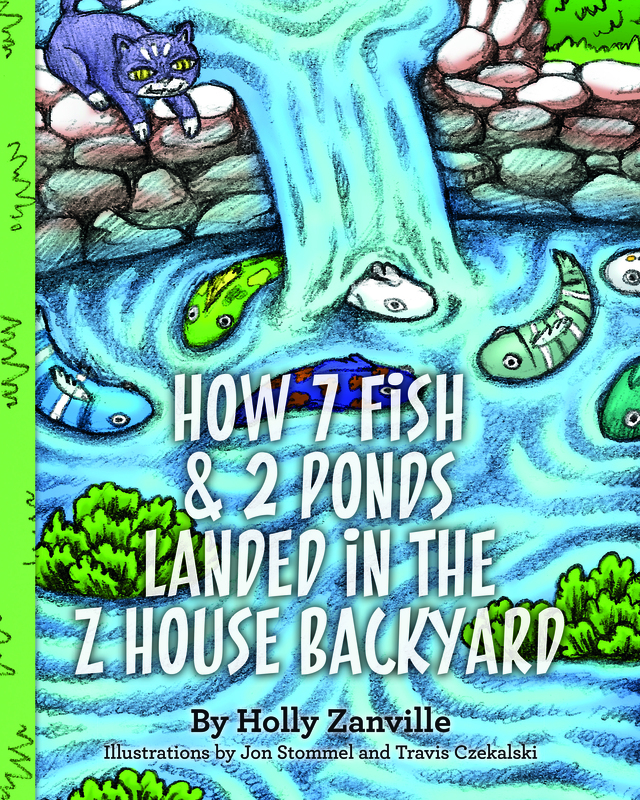 My fifth children’s picture book (How 7 Fish & 2 Ponds Landed in the Z House Backyard) came out a few weeks ago. Shortly after, the book landed gift-wrapped in a big box of gifts headed to mom for her ninety-ninth birthday. Yep, 99! After she read the new book, she remarked on the phone with surprise, “It’s a how-to book.” I agreed. I’ve been mulling over her comment for the last few days. With full intention, I did write a how-to book, hoping a child would get the gist of how a pond can be built. And hoping too that a child would get ideas like ─ ‘o look, the boy really likes fish and he wants to learn how to build a pond.’ And ‘look at all that dirt they had to dig up.’ And ‘look at the different colors fish come in.’ And ‘wow, fish can grow big just like children do and what happens when they get so big that they don’t fit in their home anymore?’ In that sense, I was also writing an “informational storybook”─ a book that uses a story to convey information. And I hoped too that children would get that they can dream up an idea and then try to realize it like Noah did in the book. All of this dreaming things up – creativity, thinking and planning ─ can start early. It must start early. Reading for information is a critically important tool in the child’s literacy development toolbox. Children need to learn early that asking questions is great ─ and learning by watching others do something is great─ and that reading is a main way they are going to acquire information vital to their lives. Here’s what distinguishes information books from other types of books (or “genres”) out there. Have a main purpose to provide in-depth explanation of fact-based material. Are literature and considered trade books. Are nonfiction but not textbooks or reference books. Inform by attention to facts and capitalizing on children’s wonder at all that is out there. When most effective, suggest a wealth of information, stimulating a wish to know more. Contain interesting details and lesser-known facts. Use expository language (writing that explains, describes, informs). Are organized using a logical presentation of information. Include photographs or illustrations to provide authenticity. When the main purpose is to inform but contain entertaining elements of fiction are called informational stories ─ informational storybooks use a storyline to convey information. Experience “authentic learning” as they investigate their own questions/topics of interest. Inquire and solve problems ─ and foster critical thinking skills. See connections and interrelationships among content and concepts. Learn about faraway places, past times, and new ideas and concepts. Begin to view the world as changing and evolving. Acquire new vocabulary and broader background knowledge. It’s not too early for young readers to know that there are many categories of books out there to provide different types of information. Trips to the library, for example, should underscore the many categories of books including story books and informational books available to them. The latter will include categories such as history; understanding peoples and cultures; nature; the arts; discovering how things work; and the how-to books. Schools, of course, play the major role in guiding children to develop their reading and information retrieval skills using reading and critical thinking. Children begin the earliest grades now (including pre-school) using an array of technology tools because they must become familiar with them early to master their uses. They will have to know what “information retrieval” processes are and how and when to use them. Their vocabulary will need to include terms such as key word search, queries, web search engines, FAQ (frequently asked questions), tutorial, user guide, database, and apps. Without this level of literacy (reading and information literacy), they’re not going to be able to fill in words within a search box to access online applications for school, employment, and do their taxes someday. A sample lesson plan from two teachers posted at Scholastic underscores the types of lesson plans teachers are encouraged to incorporate in the early grades. The lesson is aimed at pre-kindergarten through grades 1 and 2. The aim for the lesson is that “students will be able to identify nonfiction how-to books, discuss the ways how-to books are used, apply their knowledge and create a how-to book of their own.” One of the recommended activities is that the teacher will “ask parents to place focus on nonfiction procedural books that they use and will be using at home.” Scholastic offers some wonderful titles of books in the how-to category for teachers putting together these lesson plans. Of course, parents can pick up these books and many other books in the nonfiction informational category too in order to help their children learn about the ways of acquiring new information. Another Z House book that falls somewhere between informational storybook and how-to is How the Dog Came to Live at the Z House. It tells the story of a boy’s getting his first dog but also describes the many steps to adopting a dog through the local animal shelter. Scholastic (NASDAQ: SCHL) was founded in 1920 as a single classroom magazine. Today, Scholastic books and educational materials are in tens of thousands of schools and tens of millions of homes worldwide. Scholastic publishes several books that fit into a lesson plan where the teacher (or parent) could follow up to make these items in class as follow-up activity. Examples: Tomatoes to Ketchup by Inez Snyder; Milk to Ice Cream by Inez Snyder; Wax to Crayons by Inez Snyder; Pancakes for Breakfast by Tomie De Paola; Benny Bakes A Cake by Eve Rice; Building A House by Byron Barton; Bruno, The Tailor by Lars Klinting; Beans to Chocolate by Inez Snyder.